Having restored the garden to its beauty and grandeur, it’s high time to have some guests over to show off! Gardenscapes: Mansion Makeover was available as a giveaway on July 26, 2015! How would you improve Gardenscapes: Mansion Makeover? Having played nearly all day, I have really enjoyed the game, as I did the one given away a few weeks ago. Here are a few thoughts for the developers: I noticed that, unlike the previous one, this one does not put my name on the house, just "Your House". Since the programming allows use of my name in various letters/conversations, it would be nice to see my name on my house as well. Also, I noticed that while Austen uses my dog's name, he also refers to the dog as it. When we are naming our dog, why not also allow us to designate male or female and then carry that over to Austen's dialog? I like the little mini-games (fixing the water leak, building a fire, etc) but since they were unexpected additions to this type of game, it took a little thinking to figure out what I was supposed to do, so maybe a bit more instruction would be helpful. By the way, I am also a cat lover, so why can't I get a cat? Oh here's a real idea: Gardenscapes Pet Rescue, where we renovate portions of the house and rescue cats and dogs, naming them and building their special living quarters? We could have so much fun playing with them! In addition to walls, furniture, etc, our "design" choices could offer us various types of animals to adopt (I would love a greyhound!). Maybe there could even be dog and cat shows where our pets could compete for ribbons. BTW, I also enjoyed seeing some of the Playrix logo items, like the cute dragon, in some of the scenes. Nice job, Playrix, and keep up the good work! Thanks again GGOTD and Stephen. Thank you for your thoughful feedback Cara, much appreciated/ Scuze the late moderation. Slept in after a hard day yesterday. Got an even buisier day today. Have a great week and summer. amusing scenes make it a little bit more fun! Thank you for another great game and have a good week! Thanks, but something is screwie.Downloaded fine on my XP/2 laptop. When I ran it the cut scene looked like a lovely colourful horizontal line rug. After that when you hit the SKIP button it settles and showes the mansion lobby fine except Austin is horizontaly split into five. There is a white box above his head and a working Thought bubble. It all looks pretty funny/annoing. The dog does the same thing. It is still playable as the hidden object part works. Try updating your graphic drivers. Also check compatibility mode. Try changing some of the parameters, run as admin etc. check the FAQ's thread over in the game dicussion forum sticky section for other possible fixes. I've linked to in the problem section of my review at comment number 1. Love this game and I nearly missed it. So glad I got this. Win 8.1 works fine. And for those loosing their games from a new computer or computer dying, have you tried putting in on a external drive. I have and have not had a problem and I've carried it over to three computers. I like this as well as I like Gardenscapes. It is very refreshing from the other HOGs. I find it very relaxing. I like the music, but it does it a little tedious. I am glad I can adjust the music and the other sounds. That is really my only real complaint. I really hate to even say that. As long as I can turn it down, it is alright for me. No real changes are necessary as far as I'm concerned. Thanks Playrix....love all of your games. I like this as well as I like Gardenscapes. It is very refreshing from the other HOGs. I find it very relaxing. I like the music, but it does it a little tedious. I am glad I can adjust the music and the other sounds. That is really my only real complaint. I really hate to even say that. As long as I can turn it down, it is alright for me. No real changes are necessary as far as I'm concerned. Thanks Playrix....love all of your games. There are a lot of other games like this one, yes. But this particular example of the genre is a WHOLE lot better than most of them. The developer(s) obviously spent a lot of time on the "little things", the details that make it a lot more enjoyable than the "run of the mill" examples we see too much of. There are a lot of other games like this one, yes. But this particular example of the genre is a WHOLE lot better than most of them. The developer(s) obviously spent a lot of time on the "little things", the details that make it a lot more enjoyable than the "run of the mill" examples we see too much of. Wish I could offer some suggestions, but I can't think of anything that might help. I'm using Windows XP SP3 myself, and this new Gardenscapes game is working just fine with it. Wish I could offer some suggestions, but I can't think of anything that might help. I'm using Windows XP SP3 myself, and this new Gardenscapes game is working just fine with it. Has anyone ever suggested you LOOK at what a game is, and READ the material/review so painstakingly provided by the Game Giveaway of the Day Moderator, BEFORE you blindly download a game and are disappointed by it..? Do you just buy stuff at the store without looking at what it is, and then complain you don't like it when you get home? Try it next time. Read what the words say and use them to help figure out what kind of game it is, BEFORE you waste your valuable time. Has anyone ever suggested you LOOK at what a game is, and READ the material/review so painstakingly provided by the Game Giveaway of the Day Moderator, BEFORE you blindly download a game and are disappointed by it..? Do you just buy stuff at the store without looking at what it is, and then complain you don't like it when you get home? Try it next time. Read what the words say and use them to help figure out what kind of game it is, BEFORE you waste your valuable time. Funny that is how I feel about shoot 'em ups and time management and breakout games. Here there is something for everyone. If you read the description you would have known this was an HOG and could have saved the time you spent downloading it. I know some might find this game boring. I have read that HO games were right up there with doing crosswords puzzles to improve the thought processes of the aging brain. I plan to try this one. Great game, casual fun and very enjoyable! Great game, casual fun and very enjoyable! Thank you! Nice game, which plays well on my Dell laptop w/Win8.1. I enjoyed the first Gardenscapes, so was happy to see this second one show up. Good clean graphics, "fun" butler, and easy playing. Thanks, Playrix and GGOTD! I don't know that I'll ever play it. Twice I've tried to start it and twice I've killed it in task manager, after two minutes - TWO MINUTES! - the loading bar is only halfway across! This would not be unusual for a flight sim, racing sim, or rpg, but is utterly inexplicable for a simple arcade game. I installed the first Gardenscapes from here recently and enjoyed the HOG sections, but found the entire garden portion superfluous - you have no choice in layout and design, and the butler will complain until you have bought the most expensive of each item (so why have less expensive options). And I was appalled at the incredible loading times for such a simple game ...which brings me to today's offering... I don't know that I'll ever play it. Twice I've tried to start it and twice I've killed it in task manager, after two minutes - TWO MINUTES! - the loading bar is only halfway across! This would not be unusual for a flight sim, racing sim, or rpg, but is utterly inexplicable for a simple arcade game. If you're interested, there is a Gardenscapes 2. Go to the Playrix home site. Cara, If you're interested, there is a Gardenscapes 2. Go to the Playrix home site. Is there any way you can help Moonshadow? Moderators, Is there any way you can help Moonshadow? Can we have Gardenscapes 2 in a few weeks? Pretty please with flowers on top. Moderators, Can we have Gardenscapes 2 in a few weeks? Pretty please with flowers on top. Shhhh... just let the Swamp Thing doze off in his repletion and leave the rest of us play thius excellent game. Dan O, Shhhh... just let the Swamp Thing doze off in his repletion and leave the rest of us play thius excellent game. Have you tried looking for an upgrade to the dll from Creative or maybe using your search engine capabilities? duckduckgo could probably find one if it exists out there. Julia, Have you tried looking for an upgrade to the dll from Creative or maybe using your search engine capabilities? duckduckgo could probably find one if it exists out there. When your "old computer died," did it kill the hard drive? If not, you should take it out of the old computer and put it into the new one and simply use it as a data drive. You could then play all your old games, even if you need to reinstall them on your new drive. Downloaded games like these can easily be reinstalled from the original download file, wherever they are on your system (whether on your C: or D: or any other drive). Worst case scenario, you would at least know which games you can't get back that way and could then set about getting them back from wherever you can. Mac, When your "old computer died," did it kill the hard drive? If not, you should take it out of the old computer and put it into the new one and simply use it as a data drive. You could then play all your old games, even if you need to reinstall them on your new drive. Downloaded games like these can easily be reinstalled from the original download file, wherever they are on your system (whether on your C: or D: or any other drive). Worst case scenario, you would at least know which games you can't get back that way and could then set about getting them back from wherever you can. Now let the rest of us play with this one and enjoy it to our heart's content. If you had read the review by Whiterabbit, which is usually the first comment, You would have known exactly what this game is about. I've played both games and I wish they had a third one, though I would want some changes to be applied, especially to the game engine (a few small improvements would be welcome), and the graphics, what with today's improvements in graphics capabilities. Excellent! Well-articulated comment. Now let the rest of us play with this one and enjoy it to our heart's content. If you had read the review by Whiterabbit, which is usually the first comment, You would have known exactly what this game is about. I've played both games and I wish they had a third one, though I would want some changes to be applied, especially to the game engine (a few small improvements would be welcome), and the graphics, what with today's improvements in graphics capabilities. Really enjoyed the first game that was given away a few weeks ago, so am giving this one a try as well. Love hidden object games! Am hoping we'll get some more of the more in depth games though, like the Dream Hills, Brink of Consciousness, Hope Lake ones. More like Goblin Defenders would also be great! A vocabulary is a very good thing to to have the next step is to use it correctly in a sentence. Google could help you with that. Keep trying because a strong vocabulary is a very powerful weapon. Took over 390 MB on my W7x64 machine after install, and more when it starts to run looks good. nice story. I didn't download this game because I already own it. I usually don't like HOG because they are pretty boring. But this one and the others editions of Gardenscapes are pretty fun as you upgrade things like a mansion, a farm, etc. It has replay-ability because you can choose different decoration/upgrade choices each time you play and get different results each time. Also, a very good HOG if you want to introduce your kids to HOG as it is more cartoonish than animated adult movie and the storyline is simpler than than the average adult HOG. 4-Replace "C: \ Program Files (x86) \ Playrix Entertainment \ Gardenscapes Mansion Makeover \ Base" Today the game by the above. Thank you for GAOTD because since I installed the first I take a real pleasure to play ... RELAX. 2-Installer la demo en suivant les indications. 4-Remplacer le dossier “C:\Program Files (x86)\Playrix Entertainment\Gardenscapes Mansion Makeover\Base” du jeu d’aujourd’hui par celui ci-dessus. Merci à GAOTD car depuis que j'ai installé le premier je prends un réel plaisir à y jouer...RELAX. Bonjour, For those who wish to play in French: 1-Download the demo of the game in French: http://www.bigfishgames.fr/jeux-a-telecharger/18603/gardenscapes-mansion-makeover/download.html 2-install the demo 3-Go to the installation directory of the demo "C: \ Program Files (x86) \ Gardenscapes Mansion Makeover \ Base" to recover the "base" folder 4-Replace "C: \ Program Files (x86) \ Playrix Entertainment \ Gardenscapes Mansion Makeover \ Base" Today the game by the above. 5-In the file "C: \ Program Files (x86) \ Playrix Entertainment \ Gardenscapes Mansion Makeover \ Settings.xml" file, replace (local = "English") by (local = "Latin1") 6-Start the game, it should be French ... As a precaution I still keep the record "base" by renaming the original "base_EN" in case ... Thank you for GAOTD because since I installed the first I take a real pleasure to play ... RELAX. Pour ceux qui souhaiteraient jouer en français : 1-Télécharger la démo du jeu en français : http://www.bigfishgames.fr/jeux-a-telecharger/18603/gardenscapes-mansion-makeover/download.html 2-Installer la demo en suivant les indications. 3-Aller dans le répertoire d’installation de la demo “C:\Program Files (x86)\Gardenscapes Mansion Makeover\Base” pour récupérer le dossier “base” 4-Remplacer le dossier “C:\Program Files (x86)\Playrix Entertainment\Gardenscapes Mansion Makeover\Base” du jeu d’aujourd’hui par celui ci-dessus. 5-Dans le fichier "C:\Program Files (x86)\Playrix Entertainment\Gardenscapes Mansion Makeover\Settings.xml", remplacer (locale="English") par (locale="Latin1") 6-Lancer le jeu, il devrait être en français… Par précaution je conserve toujours le dossier “base” d’origine en le renommant “base_EN” pour le cas où… Merci à GAOTD car depuis que j'ai installé le premier je prends un réel plaisir à y jouer...RELAX. I got this game some time back from Alawar. I think it was a free code for doing surveys that got me the game. One difference -- I have the Collector's Edition which has an extra scene at the end. What is really funny is I decided a few days ago to play this game again and just finished it last night! Comment to Moonshadow -- If that was an update to Windows 10, I'm beginning to hear such nasty stories about that upgrade that I'm no longer sure I'll even update my new laptop -- just keep everything as is for these computers. It took me 3 months to get that laptop loaded with games. I don't really want to do it again with 2 machines! I got this game some time back from Alawar. I think it was a free code for doing surveys that got me the game. One difference -- I have the Collector's Edition which has an extra scene at the end. What is really funny is I decided a few days ago to play this game again and just finished it last night! It's a keeper. Comment to Moonshadow -- If that was an update to Windows 10, I'm beginning to hear such nasty stories about that upgrade that I'm no longer sure I'll even update my new laptop -- just keep everything as is for these computers. It took me 3 months to get that laptop loaded with games. I don't really want to do it again with 2 machines! Looks worth a shot, though from comments maybe it could stand a little more play variety within the basic HOG format. Repetition can get so old in gaming. Oh boy! More fun with Gardenscapes! Thank you GGOTD, Playrix and of course you for another great game. Wanted to add that after installing on my Win8.1 Laptop that has a touch screen, the cursor would not work by using the touchpad. Had to go into options and select cursor. Now it works. But I still use the touchscreen. Played this game from beginning to end. It got boring quick. It is the same HOG over and over and over and over again. It would have been tolerable if it had been broken up with match 3 games or some other puzzles. Instead the game keeps revisiting the same HOGs. It goes from tedious to boring quick. But, did play to the end before deleting. This game has no replay value. Played this game from beginning to end. It got boring quick. It is the same HOG over and over and over and over again. It would have been tolerable if it had been broken up with match 3 games or some other puzzles. Instead the game keeps revisiting the same HOGs. It goes from tedious to boring quick. But, did play to the end before deleting. This game has no replay value. I really enjoyed the Gardenscapes game, so I know I will enjoy this as well. Installed on WIN 7 Home Premium 64 bit. No problems. Download was fast and installation went smoothly. Opened up fine and graphics looks nice. Thank you GOTD and Playrix. I have not played the game yet because things need attention at my home, but will do so soon. I have owned this game for some time, having purchased it based on others in the series. I found it very entertaining, excellent quality, and even amusing in places. I highly recommend it to those who like this type of game. This is a replete game! Replete means that there are lots of other darn games exactly like it. Replete is a cool word! Replete is cooler than this game! Wanted everyone to know that with this Gardenscapes Mansion, I have had no problem installing and playing; exiting and saving; and returning to this game to the place where I left off in the game on my Win7Pro system. This makes me really happy as I do like these games. Thanks for having it available. I still am able to play the other Gardenscapes, but I still have to right click on that icon and left click on "Run as Administrator" to get that game to work correctly. I intend to install on my Win8.1 and my old XP. Thanks so much for having this game available today! Wanted everyone to know that with this Gardenscapes Mansion, I have had no problem installing and playing; exiting and saving; and returning to this game to the place where I left off in the game on my Win7Pro system. This makes me really happy as I do like these games. Thanks for having it available. I still am able to play the other Gardenscapes, but I still have to right click on that icon and left click on "Run as Administrator" to get that game to work correctly. I intend to install on my Win8.1 and my old XP. Thanks so much for having this game available today! Again, it's fun it's free what's not to like? Love it, got the first one a few weeks ago and am still enjoying it, was even thinking of buying this one - Thanks GAOTD Again, it's fun it's free what's not to like? I was looking forward to playing Mansion Makeover because I really enjoyed the original Gardenscapes which was given away here a few weeks ago. Sadly I can't play this new game, since on my PC it crashes at launch. Windows Debugger reports an access violation by ctdproxy.dll, a Creative Audio file in system32 which has never caused me any problems before. Oh well, I guess this is the downside of using crusty old XP SP3. Thanks very much anyway, GGOTD and Playrix - the game looks great. Best wishes to all. Really sorry it's taken me so long to reply. Been very distracted of late. Have you checked the FAQ's which I link to in my review. See comment 1 above and check the problems section for the link, or go to the game discussion forums and look for the FAQ's thread in the sticky section. As Bart below mentions, upgrading your audio drivers may help. I'd also go into compatibility mode and try fiddling around with the parameters there. Make sure you are playing with Admin rights etc. Hopefully, one of those will cure the problem. Try running the game again, then immediately check your event log. There may be an error message that gives more information on the problem. It may even be the resolution you have your monitor set at that's causing the game to crash as the resolution may not be native to the game. I hope one of the above fixes the problem. Unfortunately this game isn't available on any of the free game sites at the moment. Woohoo! another game that I lost when my old computer died that I can get again! Actually, I bought this game from Bigfish, but I'll get it here instead of reloading from BF. This is a meld of hidden-object and time-management (but you can play in relaxed mode), perfect for a 20-minute break. Austin the butler, and the dog are an amusing touch to the game, and the graphics are as clear and bright as we've come to expect from Playrix -- enjoy! Woohoo! another game that I lost when my old computer died that I can get again! Actually, I bought this game from Bigfish, but I'll get it here instead of reloading from BF. This is a meld of hidden-object and time-management (but you can play in relaxed mode), perfect for a 20-minute break. Austin the butler, and the dog are an amusing touch to the game, and the graphics are as clear and bright as we've come to expect from Playrix -- enjoy! This is a meld of hidden-object and time-management (but you can play in relaxed mode), perfect for a 20-minute break. Austin, the butler, and the dog are an amusing touch to the game, and the graphics are as clear and bright as we've come to expect from Playrix -- enjoy! Woohoo! another game that I lost when my old computer died that I can get again! Actually, I bought this game from Bigfish, but I'll get it here instead of reloading from BF. This is a meld of hidden-object and time-management (but you can play in relaxed mode), perfect for a 20-minute break. Austin, the butler, and the dog are an amusing touch to the game, and the graphics are as clear and bright as we've come to expect from Playrix -- enjoy! 140 MB download for nothing - a totally trash-game. First time that I say "no" to a playrix-game - can be useful for kiddies? Search-games are boring, boring, boring...I don´t like them. You can change the in game music by replacing the appropriate Windows Media Player tracks with renamed tracks from your own music collection, though you will have to convert them to the appropriate audio files. 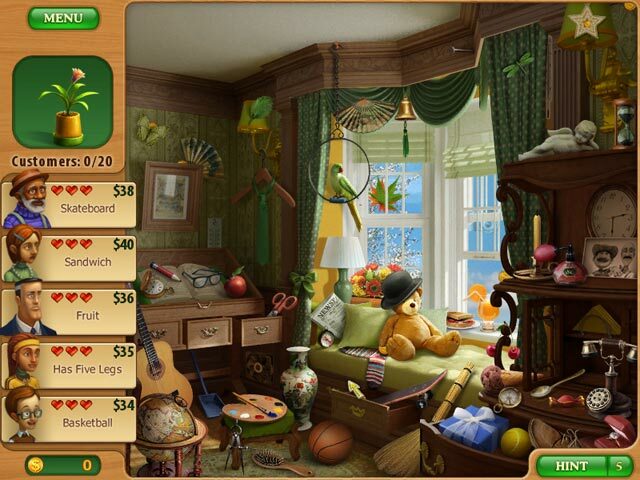 When we last played Gardenscapes, Playrix offered us a chance to create the garden of our dreams by completing tons of hidden object scenes in order to earn money via a never-ending yard sale. Now that the garden is the talk of the town, plenty of friends want to come and visit. Unfortunately we’ve spent so much time out in the garden that we’ve completely forgotten about the sad state of the mansion itself! In Gardenscapes: Mansion Makeover, you’ll need to throw another yard sale in order to purchase upgrades for your mansion before your friends arrive. Gardenscapes: Mansion Makeover is like a friend you haven’t seen in some time who has acquired a couple of new hobbies since you last met. Here, you’ll find that the home’s scenes have been updated with all new items to find in each, but the same repetition has been carried over from the original experience. That is, while there are a wide variety of rooms to search through, they repeat on a sort of cycle, with 20 customers arriving at the left side of the screen, each with their own demands. You’ll still need to claim your profits regularly, which can make things just a bit hectic if you’re playing on a timer (you can also choose to play without one for a more relaxed game). As in the last game, power-ups and coins are scattered throughout each scene. If you’ve used one of your five hints, you’ll be able to find question marks in scenes as well, which will show you a visual of each item on the shopping list, rather than forcing you to find these items based on text alone. In addition to the camera power-up that highlights all required items in a scene, you can also collect thermometers that turn your mouse into a hot-and-cold game, highlighting items in red for hot and white for cold as you’re closer to them (or farther away). Back in the mansion itself, you’ll be able to purchase upgrades for flooring, furniture, bookshelves and other large structures, along with decorative upgrades like birdcages or electronics. You’ll have various options for each upgrade, which vary in terms of price and appearance, and after you complete each set you’ll complete various light mini-games, asking you to stop a leaking roof, play with your dog and more. Overall, Gardenscapes: Mansion Makeover isn’t really revolutionary, but it’s more of the same charming and downright fun gameplay that the first game offered. The power-ups offer you a chance to make the game as easy as you’d like (or as difficult, if you ignore them), and the customization options mean that no two players will really share the same experience when all is said and done. 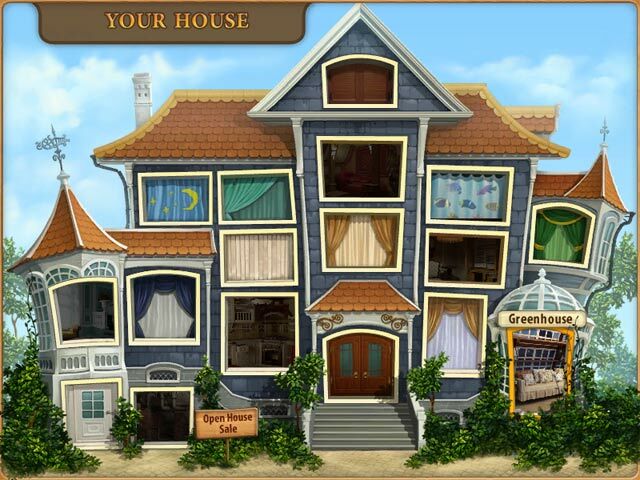 Gardenscapes: Mansion Makeover is an incredibly solid and polished hidden object game that, while repetitive, offers a certain spark that just can’t be defined. If you enjoyed the first Gardenscapes title, or enjoy games like it, you definitely need to try this one out as well. You can find videos of game play HERE, HERE and HERE. I haven't had enough game play time to give this an unbiased conclusion, suffice it to say, it follows Playrix's usual quality and for anyone who loves a HOG this is a decent one; plus, for those who still like to run screen savers, this game also includes one that the kids will love. I did find the odd clue for example cloths pin and painted jar a little confusing, at least for UK community members call cloths pins clothes peg and painted jar a painted jug. I liked the way you earned money from selling items that you found in the hidden object screens and it was fun making up the interior of the mansion, unfortunately I didn't quite get as far as the garden yet. I replayed the game with a few different names and each time the levels played slightly differently, so there is a decent amount of replay value in this game. Even decorating your mansion can be done differently each time as you have up to four selections for each item. If you have any problems installing or getting today's game to work please go HERE for help. I've posted most of the common problems and solutions in a FAQ thread, which you can find in the sticky section of the forums by following the above link. It's worth checking the giveaway game discussion forums the day before the giveaways go live to see if we are getting a large sized file; this is especially important for those who have slow connections and even more so if the game is popular. We can have up to forty thousand (40 000) community members downloading over the 24 hour period, with the bulk of community members downloading in the first 12 hours of the giveaway going live, there is always a massive strain on the giveaway servers. The bigger the file size, the more community members will be downloading at any one time. Because the bandwidth is shared equally amongst all community members, downloads can become excrucatingly slow, so if you do have a slow connection, its important to start your download as early as possible to avoid disappointment. Because these games are free, the giveaway owners cannot invest in more bandwidth without compromising the whole project, so we have to be satisfied with what we have at present. It’s always worth checking out the free games sites because sometimes the games we get here are also available for free from them. MyPlayCity (MPC) has the most with over 1000 games to choose from; however, (today's game isn't available from any of the sites I know of but ten of the 12 in the series are available (Farm Frenzy, Farm Frenzy 2, Farm Frenzy: Pizza Party, Farm Frenzy 3, Farm Frenzy 3: Ice Age, Farm Frenzy 3: Madagascar, Farm Frenzy 3: Russian Roulette, Farm Frenzy: Ancient Rome, Farm Frenzy: Gone Fishing, Farm Frenzy: Viking Heroes.) from MPC and TooMyk Games also have a few of the series). Other sites include Gametop, TooMyk Games (I've not included a link for this yet) and FreeGamePick. There are 420 games on sale over on Steam this week, ranging from 10% to 90% off. Also there is a special Quakecon sale on with specials heavily discounted each day, todays hevily discounted game is Wolfenstein plus all ID titles. This weekends main deals are The Talos Principle an excellent philosophical first-person puzzle game from Croteam (the creators of the Serious Sam franchise) and the Tropico franchise, that combines real-time strategy and simulation elements with a healthy dose of political intrigue and Caribbean flair to create a unique and critically acclaimed game experience. You can find a full list of all sale items HERE. I've removed the Desura link because the owners are bankrupt and there has been no activity on the site in a couple of weeks. If you own any games via desura i advise downloading all of the drm free games you have on that platform before the site is taken down. The latest IndieGameStand game is called At the mountains of Madness, an Indie Lovecraftian PC game based in the novel by H.P. Lovecraft, currently under development. An expedition to the Antarctic continent back in the 1930's where you will encounter ancient creatures and fight against the elements in a horror realtime adventure. Buy the game now and get instant early access for the alpha version. Note: This Early Access game is not complete and will change further. If you are not excited to play this game in its current state, then you should wait to see the game progresses further in development. The current Alpha version is a playable preview from the first two levels from the first Chapter, explore the world and game mechanics and survive to complete both maps. The game has been Greenlit on Steam Greenlight, so a Steam key as well as a drm free copy is available. This bundle ends around 5am Wednmesday 29th July (GMT). The free game from Origin has changed to Zuma's Revenge the sequel to the excellent Luxor style marble popping match 3 game. This is one of the better Marble poppers. Check it out HERE.